PROVERTHA expanded its broad portfolio on M12 connection solutions introducing a very compact distribution box based on its flexible and modular distribution system. The compact box enables space saving and functional safe solutions for a great variety of applications and provides 360° shielding for highest EMC needs. The compact distribution system convinces on the one hand by its flexibility and is tailor-made for various applications with the expansion options (duplication) of the basic version by means of an adapter. On the other hand, this distribution system ensures high reliability through its special design with full metal housing and vibration-proof crimp technology. 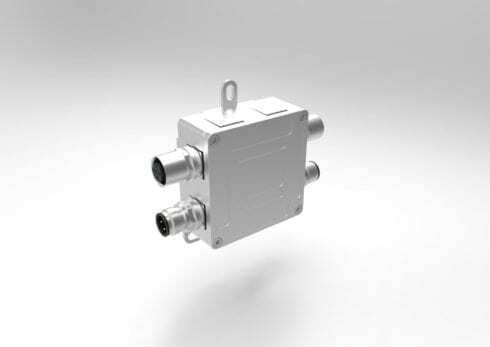 This makes the box ideal for robust applications in rough environments. The 360° shielding is due to a special full metal housing design. The box offers up to eight inputs/outputs, while unused inputs/outputs can be closed by a blanking plug. Plug & Play is provided with M12 connection male or female for the codings A, B, D, and A-8. Crimp flange or crimp sleeve enable reliable cable shield and strain relief torsion- and vibration-proofed connections. In addition, a cable clamp supports special cables with an outer diameter of up to 14mm. Cable bushing is available for cost-effective cable connection without special requirements. Two integrated fastening straps provide reliable wall mounting.